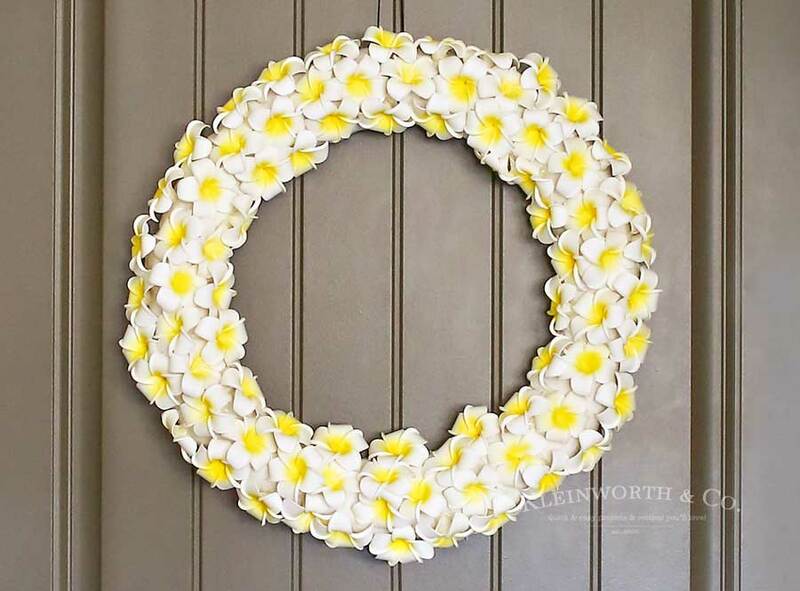 This Plumeria Wreath is the perfect summer front door decoration. 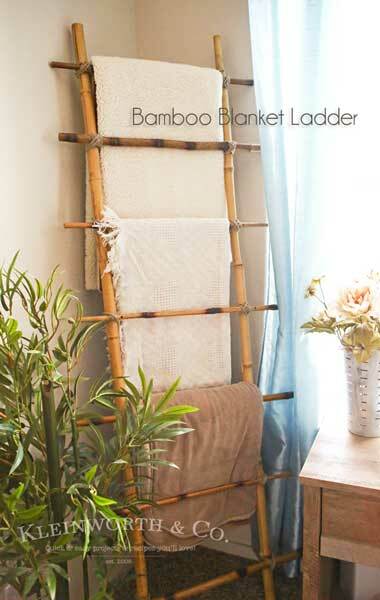 Check out my full how-to tutorial on this simple & easy DIY project for the home. I absolutely love plumeria. It’s my favorite flower, aside from gardenias of course. Long, long ago I made a trip to Hawaii. Every day I would walk around the corner from my hotel to the little flower lei stand. 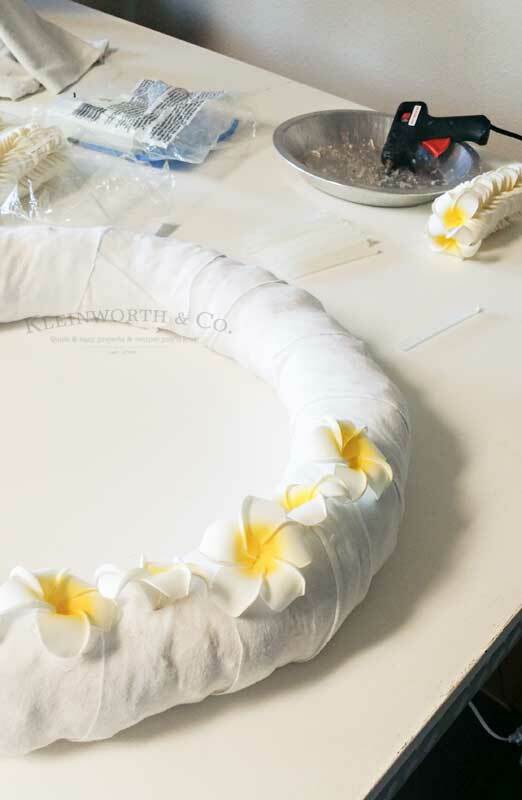 There was a little woman in there working her fingers to the bone making gorgeous leis & I bought a fresh one every day I was there on the island. Then one night we went to a luau & I wanted a really special one. I purchased one made from plumeria that was massive. It was thicker than my arm is round & it was like heaven to wear. I also bought a matching anklet because I was feeling extra fancy. It was magnificent & the smell- swoon!!! That was such a highlight of the trip & ever since then I can’t get enough of plumeria. I love making wreaths & try to make a new one for the door every month. I made this one with foam plumeria last year for my August decor on the porch. But by then the editorial calendar had moved into fall & school related ideas. Sadly I never got the chance to share this wreath with you. So I couldn’t let another summer go by without sharing it here. 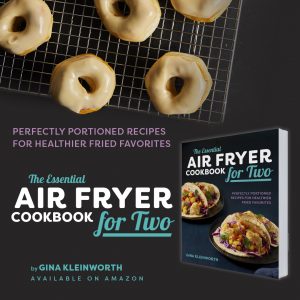 I have links to the products used here for your convenience. Some of these may be affiliate links. Your cost is the same, but I receive a percentage that helps support the website and keeps everything here FREE. 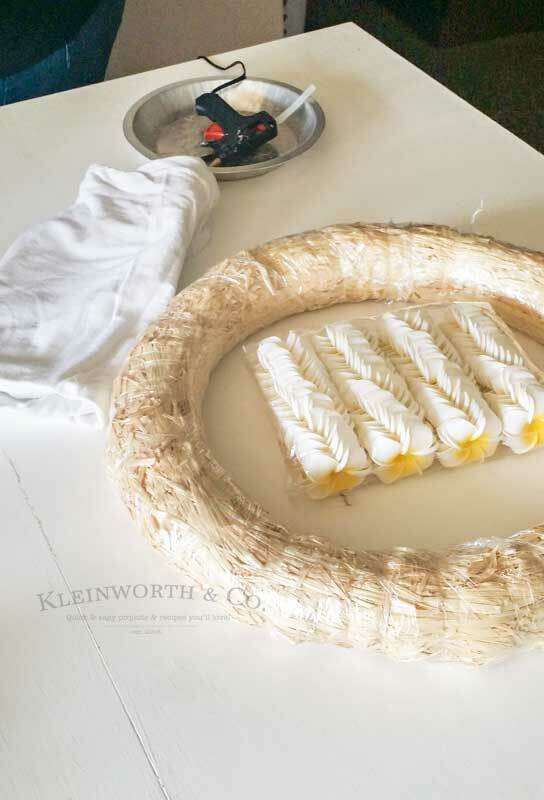 Straw Wreath, old white t-shirt (any white fabric will do), 150 foam plumeria flowers, hot glue gun & glue sticks, wire. 1. Heat your hot glue gun. Unwrap your wreath form, you don’t want the plastic on there- even if it helps keep the mess down. Hot glue & plastic don’t mix well. Right?! 2- Cut your t-shirt or scrap fabric into long strips, approx 4-5 inches wide. I basically just cut the bottom of a super large t-shirt off right under the sleeves & then cut that large piece into the strips I needed. 3- Wrap fabric strips around the wreath form until it’s completely covered. Use your hot glue to tack each piece on & secure it there. 4. 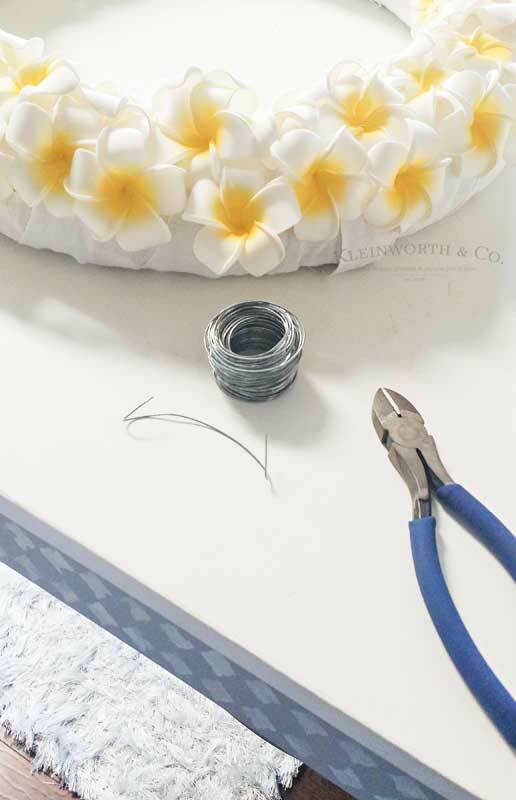 Once your wreath form is completely covered in fabric it’s time to start adding your plumeria flowers. 6. Keep gluing those flowers. I know this part can be tedious, especially if you are making them really tight together. 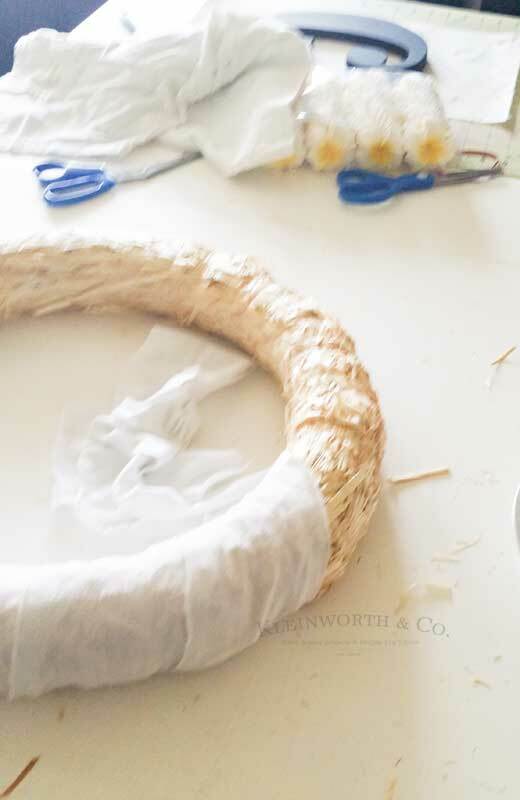 But believe me, it’s worth it in the end to have a beautiful, summer wreath. (to save on flowers & time I chose to only do the portion of the wreath that would be exposed when hanging on the door- leaving the back side empty. This also helps it to lay flat on the door. There wasn’t any sense in adding flowers to the area that would be covered. 7. Now it’s time to add your hook. I cut a piece of wire & bent it in a V-shape. Then I poked the ends into the back of the wreath & secured with more hot glue. Once the glue had dried I pushed the wire out a little to give it some space to fit over the hook on my door. That’s it- easier than it seems at first! The hubs said this plumeria wreath is one of his favorites of all the wreaths I have made in the 20 years we have been together. I guess he really likes it. 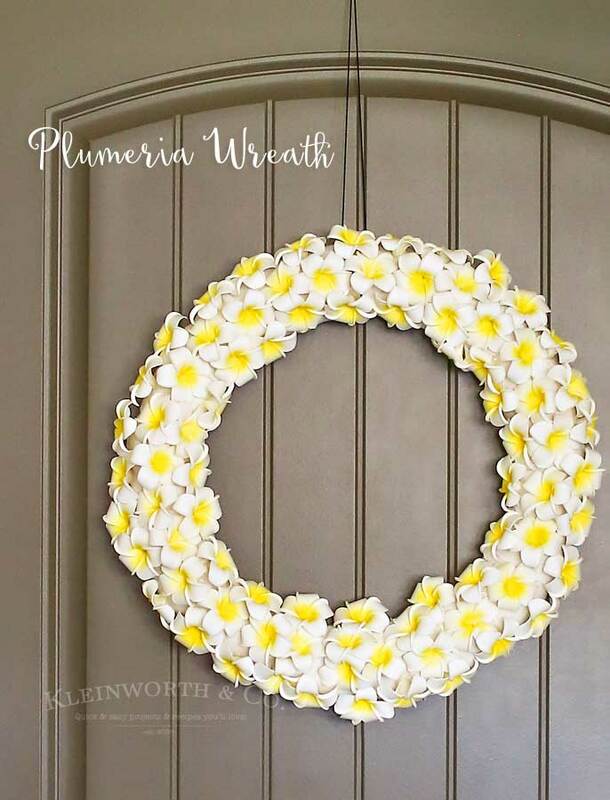 Looking for more of my favorite summer home projects like this plumeria wreath? I love this wreath, and it looks so real! Thanks for sharing with us at the Totally Terrific Tuesday party, I am Nicki, one of the new cohosts! Just . so . pretty ! 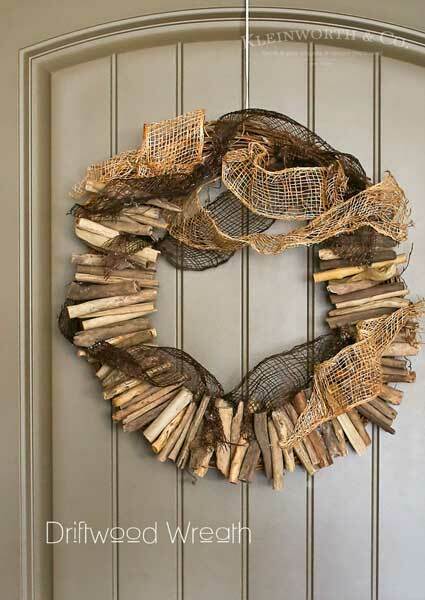 I love this, and I’m not much a a wreath fan, the simplicity of this is just lovely. That is a beautiful write. I have to admit I am not familar with plumeria, but they are a beautiful flower. 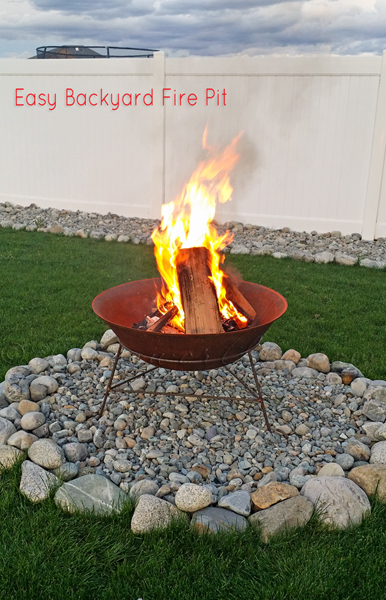 Thanks for linking up at Let’s Get Real Friday.